Our combined Second Hand Store & Crafts Shop is open regularly on Monday, Wednesday, and Saturday from 10AM to 2PM. 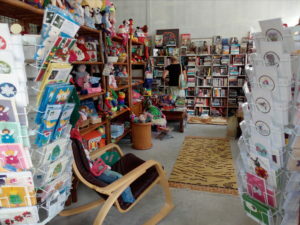 We have an ever changing inventory for the thrifty buyer, the vacation reader, and shopper looking for something unique. Volunteer helpers are always appreciated and we gladly accept clothing, toys, books, and small household items for resale. All monies that we make are ‘recycled’ back into projects supported by Good Shepherd Phuket. To help the people we shelter and care for develop skills to become self-sustaining individuals with dignity so that they can improve their quality of life, their families, and help to support the Good Shepherd to therefore support others in need. Women from Good Shepherd projects come together to make many goods including toys, cards, bags, gifts, cushions, dolls and other gifts. All our products have been handmade by, or help those that have been abused, are poor, or suffer from HIV. Need a souvenir or gift to take back home to your family? Why not purchase a beautiful handcrafted item while also supporting a wonderful cause!! Take a peek at some of the products we sell at the shop. Our inventory changes frequently and 2nd Hand Items changes regularly – click here. Selected stock can be found at exclusive hotel boutiques; Paresa, Amanpuri, The Surin and Dewa Resorts. Stop by the Delish Café in Chalong for a cup of coffee…they also offer a large selection of our products. You’ll also find a small selection of items at Lady Pie in Cherngtalay. We operate a prosperous and growing 2nd Hand Shop with clothing, toys, and other pre-loved items donated to us. You can’t find a better value when it comes to our Used Books. Most items are priced at a mere 20 baht to make our offerings affordable to the less fortunate. Monday, Wednesday, and Saturday from 10AM to 2PM. Sell our products abroad by taking them home. If you know of a retail outlet that would like to carry our products in Phuket or abroad, please speak to us today!! If you are a crafts maker and enjoy teaching others – contact us to run a craft workshop at our Home for Hope – Helping to transfer skills to women less fortunate here in Phuket.